What you eat can effect the health of your skin. Your epidermis, aka the the top part of your skin, is your body’s largest and fastest-growing organ, and the food you eat breaks down to form the very cells of it. There is no one food that will “cure” all your skin problems. However modifying your diet to regularly include the following healthy skin foods will help nourish your skin & assist with reducing acne, inflammation, dry flakey skin & premature aging. 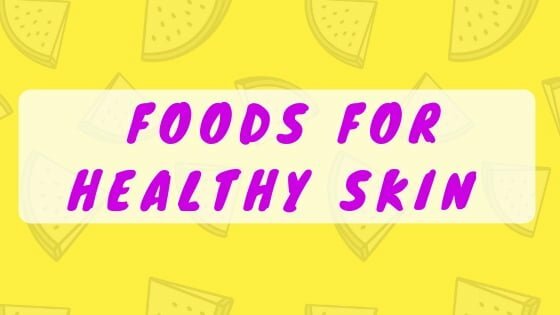 You need to nourish our skin from the inside out, so if you want glowing, radiant, healthy skin, include the following healthy skin foods in your daily eating. Fatty Fish – think salmon, tuna, trout, mackerel and sardines. These fish are rich in omega-3 fatty acids, protein and other key minerals, like zinc & vitamin E, that are important for healthy skin. Omega-3s in particular can help reduce inflammation, which can assist with acne management, and keep your skin hydrated. So if you have acne-prone, dry, inflamed skin, add a serve of fish into your daily eating. Try my Healthy Salmon & Veggie Pizza and my Home-Made Poke for a hit of oily fish! Lentils, Beans & Sweet Potato – rich in protein, minerals and low GI carbohydrates, these foods will help prevent your sugar levels from spiking & dropping quickly. Foods that raise your blood sugar levels too quickly (i.e. high GI foods – think white refined carbs) can cause a release in the hormone insulin which causes your oil glands to produce more oil, increasing your risk & severity of acne. Instead, aim for low GI foods like lentils, beans and sweet potato which don’t cause your blood sugar levels to spike. Try my Crispy Sweet Potato Fries and Vegan Meatballs for a healthy low GI snack. Berries – think blueberries, blackberries, strawberries, raspberries, acai berries, goji berries & boysenberries. Berries are a power house of super food skin nutrition. The natural plant pigments in berries (scientifically known as polyphenols, flavonoids, anthocyanins and tannins) give berries their vibrant colours, and these can actually make your skin look vibrant too! Berries are also high in vitamin C and antioxidants, which fight off free radicals that can otherwise your damage the cells. Antioxidants prevent the breakdown of collagen and elastin, which are the fibres that support your skin structure. So eating berries can help prevent wrinkles and other signs of premature ageing. Try my Strawberry Compote and Strawberry, Mint & Coconut Nicecream. Avocados – rich in healthy monounsaturated fats and vitamin E & C, avocados are an excellent healthy skin food. They also contain properties that can help protect your skin from sun-damage, so next time you’re out, grab that Smashed Avo or try my Healthy Avocado Burrito Bowls and Creamy Avocado Pasta. Flaxseed, Chia Seeds & Walnuts – your skin is built from nutrients including omega-3 fatty acids, proteins and minerals. Chia, flaxseeds and walnuts are bursting with these healthy beauty nutrients, particularly omega-3s. These healthy fats form the cellular structure of your skin and support skin suppleness. If your skin is dull and flaky, you may be lacking Omega-3s. Try adding some flax, chia and walnuts into your daily eating to enhance moisture retention and hydrate your skin. Omega-3s are also anti-inflammatory, aiding to reduce skin irritations & redness, especially with relation to acne. They are also a good source of zine, vitamin E, selenium and protein, all of which are key nutrients for your skin. Try my delicious Bliss Balls as a snack made with walnuts. Pumpkin & Pumpkin Seeds – also known as pepitas, pumpkin seeds are a beauty food secret. Pumpkin seeds are high in nutrients like protein, vitamin E, iron and magnesium that contribute to skin cell regeneration, tissue repair and the formulation of collagen and elastin. Thus they support skin structure and reduce visible wrinkles and other signs of premature ageing. Pumpkin seeds are also rich in zinc which has been shown to help with acne prevention and healing. Further, the antioxidant carotenoids, which give pumpkin it’s orange colour, also protect your cells from free radical damage and help your skin to heal, especially from flaking or redness. Try my Creamy Pumpkin Soup with a Thai Coconut Twist made with both pumpkin and pumpkin seeds! Kiwi Fruit, Mangoes, Oranges, Lemons + Other Vitamin C Rich Fruits – Vitamin C acts as an antioxidant to fight off free radicals that can otherwise damage the fibres that support your skin structure like collagen and elastin. Including a daily serve of these Vitamin C rich foods can help prevent wrinkles and other signs of premature ageing. Fit a big hit of Vitamin C, try my Kiwi Fruit Smoothie, Persimmon Smoothie and Lemon Chia Overnight Oats. Leafy Green Veggies – think rocket, kale, spinach, cucumber, radicchio, bok choy, lettuce, broccoli, celery, watercress and wheatgrass. Fresh leafy greens are packed full of essential minerals & vitmains for healthy skin. The most nutritious way to eat your greens in in their fresh, less cooked state. Overcooking, like boiling, can destroy certain nutrients in green veggies, especially the water soluble vitamins. Try my Green Smoothie to give your skin that healthy glow. Soy Products – think tofu, tempeh, soy milk. Soy contains isoflavones that have been shown to improve collagen, reduce wrinkles, improve skin elasticity and reduce skin dryness. Try doing meat-free Monday and swapping your steak & veg for a tofu stir-fry. Water – your body is more than 65% water and your skin, which is your largest organ, needs water to keep healthy & hydrated. Water is also needed to help flush toxins out of your body, which can otherwise build up in your skin, resulting in acne & clogged pores. Aim for a minimum of 2 litres per day and always opt for water over sugary drinks like soft-drink & cordial. High GI/refined sugar foods – these foods raise your blood sugar levels too quickly can cause a release in the hormone insulin which causes your oil glands to produce more oil, increasing your risk & severity of acne. For example, you should limit your intake of white, refined carbohydrates like white bread and swap for wholegrain options. Any foods you are allergic or intolerant to – if you have a medically diagnosed allergy or intolerance to a food such as gluten or dairy, it’s best to exclude / limit your intake of these as they can impact the health of your gut. Your gut health is closely related to your skin health as it helps digest and absorb nutrients. This is a huge topic, so I’ll go into gut health in a separate blog post. It is important to remember that other factors like stress, hormones, your environment, sleep patterns, the weather & skin care effect your skin health too. If you need further assistance with your skin health, I would recommend getting a skin health assessment check. I had one at The Skin Manifesto & it helped so much. They offer one-on-one attention and solution-focused treatments & treat your skin holistically to rejuvenate and activate your skin naturally!